EXCLUSIVE OFFER TO OUR EXISTING AND NEW MELBOURNE CUSTOMERS! Forex Cargo Australia is focused and geared up to provide you with the highest level of Service in Melbourne which is why we have a new fleet and have appointed a new Cargo manager to ensure you are looked after efficiently and effectively. In celebration of this announcement, Forex Cargo Australia would like to offer you a voucher of $10 OFF for every Forex Balikbayan Box you send to the Philippines from today until April 30 2019. Download your Exclusive Voucher here. 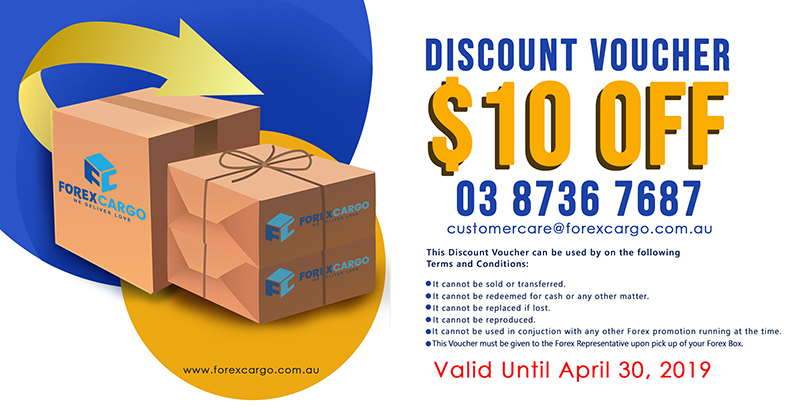 Simply print this voucher and present to our Cargo representative upon pick up of your Forex Box to redeem your $10 discount immediately! Please feel free to share this great news with your friends, so they too can take advantage of our discounted savings during this time. Not yet a Forex Cargo Australia Customer? Sign Up here or you may contact our call centre on 03 8736 7687 or email us info@forexcargo.com.au to arrange your Forex Balikbayan Box today!